Ant’s son, Jourdain, and his fiance, Nettie, brought their new addition to the family to meet us last night. We all fell in love with gorgeous Dobby. 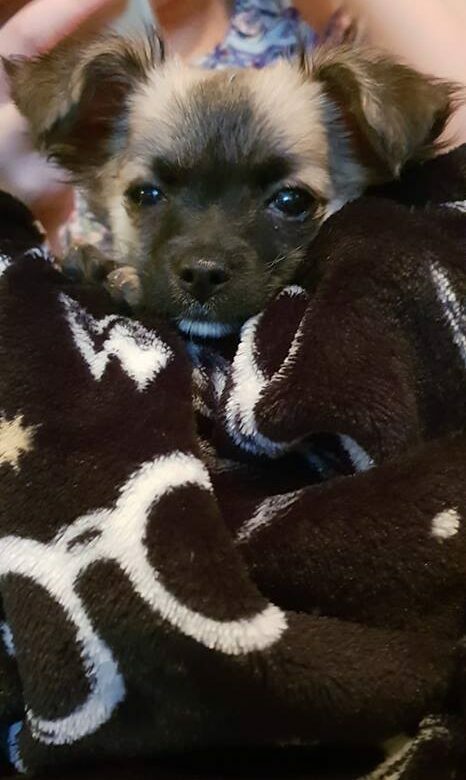 She’s a beautiful tiny baby chihuahua. Here she is snuggled up on KayCee’s Harry Potter blanket! KayCee now wants a chihuahua. Ella still wants a guinea pig so Ant said they can both have what they want if they can keep their bedroom tidy for 6 months. They tried before and managed a couple of months until Christmas came then it all went to pot! Aww! She is just the cutest! I love the name! I need a Dobbie!! My mum has a long haired chihuahua, his names Ozzie and he’s gorgeous.